The controls r just so absurdly annoying, because of the fact that half the time u hit the shoot button and they pass. Or u hit the jump button to block and they swipe to steal. Where did they go? Under rated players! I had played and unlocked every thing that could be unlocked. Deleted the game for a while then re-downloaded it because I was ready to JAM again only to find that with the new update there were players removed. Well at least one. Where did Scottie Pippen go? There was nothing like playing the game with the 96 bulls with Pippen and Rodman, but now it's gone. What a shame😞 If that wasn't enough I looked at Kawhi Leonard and his abilities in the game don't match up to his true abilities. It's time for a new update!!! I understand that players move a A LOT more now a days which makes it difficult to keep decent rosters in the game, but put forth some effort!!! Every time I am in the lead my game crashes. Fun way to kill time but the game should be updated regularly with new rosters. Reborn! Wait.... you’re missing something vital! I have been playing the heck out of this game since it’s been updated but I can’t find any way to get the Beastie Boys! Where are the Beastie Boys? I want the Beastie Boys! I’ll give another star if you update it with the Beastie Boys! Hello? Anyone? Developer? B-Boys? Fight for your right to play the B-Boys! I’d love an iPad version and mfi controller support. The game is fun but it’s hard to continue playing the same old version year after year. Please update the rosters! The game is fun and is very nostalgic. Rosters are okay, a few changes since what I remember years ago, but that is okay. Controls are difficult though. The game frequently passes when I want to shoot. At first, I thought it was a fluke, but I have watched my fingers and saw the shots turn into passes. I wish there was a way to adjust control spacing. Not worth it, the cpu cheats constantly and makes the game unenjoyable. You can’t make 3 pointers even if the player is rated 10/10. The cpu will block shots when they aren’t even in the way. As soon as the ball is passed to you the cpu pushes you down. Absolute garbage!!! I use to love this app but they need to seriously update the rosters. That’s the one thing holding me back from downloading it again. Update rosters with new NBA players, and some on the right teams they are on now. Plus add some more NBA greats. Then this game would be a 5 out 5. When will the players change? This game is so great!! I play it every day!! How f**king hard is it? You make so much money EA. I’d even pay $1.99 each year for updated rosters for this game. But you don’t care about your fans. You bought titles and ran them into the ground. You’ll be remembered as the worst company in gaming history. It keeps thinking I'm telling it to pass when I tell it to shoot, especially when coming off turbo button. This game is pretty fun and realistic. I enjoy playing it especially since it doesn’t use data or anything. But, there is one, just one thing in this game that makes make me dislike it very very much. When you are about to shot and you click the shoot button but out of no where it passes the ball to you teammate. IT MAKES ME FURIOUS! I hate it so much and that is why it makes me dislike the game more than I should. It’s 2019 and Garnett is still on the Brooklyn nets ??? He’s retired ?? I love the game but I am having an issue with it crashing. Specifically when I block my opponent from making a jump shot. It seems random but I can’t make it through a game without this happening and when I reboot I have to start the game over. We really need a roster update ASAP!!!!! What are you updating exactly? I’ve seen several updates but they have all been meaningless. If you want to update something, try updating the out of date rosters in the game. Some of the players (not including the past stars) aren’t even on the team any more. Your updates are meaningless. Great job with the game! The controls are good for playing on an iPhone and easier than I thought they would be. Super fun! I need Penny Hardaway!!! Please add him. What about the Sonics? Kemp and GP were dominating in this game back in the day. A Michael Jordan unlock challenge would be amazing! Thanks for bringing one of the all time great basketball games back! 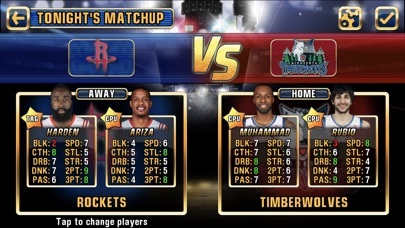 Please find a way to update the rosters, such a good game to not be relevant with the times or make an NBA Jam 2. I see y'all updated the app but the rosters are still 2-3 yrs outdated... Seriously?! EA is losing an opportunity to have a good game in the App Store. UNTIL YOU UPDATE THE ROSTERS this game is trash. Will not sure what they are updating if it’s not the rosters. DELETED until rosters are addressed. As a kid growing up, I absolutely LOVED this game, so once I saw it as an app, I immediately downloaded it. The initial setup was quick, easy to understand, & fun. The first game I played was nostalgic & brought me back to the late nights, going into the early mornings, of playing JAM with my best friend as a kid. However, the second game is when things got annoying. I played the second game at least 5 different times, in different locations just to make sure it wasn’t my internet connection(s) which it wasn’t, & I kept getting kicked out in the late 3rd Quarter or early 4th. It’s highly frustrating & annoying! I’m glad that I didn’t spend any money on this game, because I almost did. If the developers will fix that issue, I’ll come back & give the game 5 stars with a glowing review. Until then, it’s 1 star (simply because I can’t give it a 0 &/or negative rating) & I’ll tell people not to waste their time on this game. This game was never made ‘Universal’ so I can play on my iPad as well? Devs stopped making two separate apps for iPhone/itouch and iPad loooong ago. Of course greedy EA refuses to get in line with the rest of the market. I hate to put this out there for the whole world to see, but I navigated around your website way too long to report a simple bug. The bug is this: while playing the classic campaign, the announcer referred to either Javale McGee or Danilo Gallinari (Denver Nuggets) as “Tyreke Evans” during a shot and a rebound. Having been an IT developer, my feeling is without rewriting the entire app, they can't update the rosters in its current setup. So instead, they just tweak the experience so it's fantastic. Sad but I bet that's the issue and why nobody has done anything about it in 5 years. UPDATE PLEASE!! Let me play the game with Mfi controller! Great game but the rosters have not been updated in years. 5 stars if the game was updated. Update the rosters. You tweak the game but do nothing with the content. Please update the rosters. How bout y’all make some “tweaks” to the roster? I honestly love this game except for one thing.........THEY NEVER UPDATE THE ROSTERS LOL. Like literally they haven’t updated the rosters in about 3 years or so. Kevin Duran is still on the thunder in this game. I would gladly give them 4 or 5 stars if they updated the rosters and didn’t slack on making the game more up to date. App recently updated but rosters not? Need to update the roster, current players are on other teams!!! Good game. Please make another update and add 2018-2019 rosters. Otherwise, pretty solid. Gameplay is fantastic, and the arcade style of game truly bring a throwback feel. I am only a pre teen, but I love this game. I don’t have any nostalgia but it’s still so fun to play with all the crazy dunks and how you have to time your shot. Would recommend this game to anyone. The rosters on this game is seriously outdated. It just needs roster update we'll be fine . MAJOR ROSTER UPDATE NEEDED ! I purchased this game long ago, I just got back to it. I suggest you guys keep improving the game with different options and just keep the game moving. I know there is much more you can add for improvements. Although this game is still fun and enjoyable, I’d like to see the rosters updated yearly so match ups continue to be interesting as well as being able to unlock other characters that have possibly since retired in the past 5 to 10 years. Great game!!! Remember it playing it on Sega Genesis and Super Nintendo. Please add more fun to it adding 2018-2019 player rosters to their current teams and new players in the NBA. Such as Lebron James, Lonzo Ball (Lakers) Kevin Durant (Golden State Warriors). Love playing this Game but please update roster.. Excellent game from my past. The only major drawback is the failure to switch sides at halftime. And the occasional glitching controls not sensing touching of screen. The game is okay and not really worth the 4.99. It’s honestly worth like .99 or free. The rosters are like 3 years old and the game is way too easy. As many have already said, this game needs an update with the new nba roster, please update. It has been too long. Keep the app buyers updated and you will get new ones even. The game is a classic. It’s fun to play. That being said,... For god’s sake, please update the rosters! I want to run the floor with Kyrie and Gordon in Celtic green! Instead, I’ve got Avery Bradley and Gerald Wallace?!? C’mon!! Was great, but now lame and won’t even open, DON’T BUY! I loved this game back in the day in the arcade, and I first got the iOS version back in 2011, it was DOPE and rekindled fond memories. Then around the release of iPhone6 the app didn’t want to open, ever!!! Even today on my iPhone X it still crashes on start up. Prior to that the rosters weren’t being regularly updated (2014 is it’s last roster update), along with some questionable player stats & outright player omissions. I REALLY enjoyed playing this game the first few years (despite the ridiculous cheating the A.I. does after half-time when you’re whooping the computer’s arse) but the past 3 years I couldn’t even open the game as it always crashes now. Just happened again today (and yes I keep the app updated) so I finally deleted it. Don’t waste your time or money as EA stopped caring about supporting this game years ago. Does EA Sports even look at these reviews? My number one complaint with this game is that they seem to only update the rosters about once every three years. They even say "updated rosters!" on the app when you find it in the App Store, yet Steve Nash is still on the Lakers roster. Plus they have players numbers wrong. LeBron wears number 6 with the Cavs? Come on, are you even trying? I think the last time they updated rosters was 2014. I just got an update for this app today so I was really excited that they might be updating the rosters since the update was around 350mb. But nope, it was a huge update that took forever to download and it didn't change a thing. So frustrating. Also lets talk about player ratings. LeBron and Kyrie are both rated as 9 for 3 pointers, but Steph Curry is an 8 for 3 pointers? How do you determine player ratings? Do you draw numbers out of a hat? I gave this app 2 stars but only because it's fun to play. Considering the cost of $5, I would not recommend this game to others only because EA Sports does nothing to maintain rosters or ratings and they clearly ignore user feedback. Ever since the update the Game keeps crashing!!!! I gave it a chance thinking I might have accidentally touched the wrong icon while playing but over and over again, the game has been screwing up. My finger was centered on the turbo while running and several times now my player, while on defense would push or jump when I never moved my thumb or on offense launch the ball for a full court shot! This has significantly and negatively affected the entire gameplay. Another glitch, amongst a number of glitches, is if I do a layup or shoot the ball and the ball rolls around the rim before dropping through the hoop, after the ball goes in, the announcer will say 'score' or '2 points' or whatever and then say 'rebound' as the opposing team takes the ball out for the inbound pass. So whoever is taking the ball out automatically gets awarded a free rebound. Sometimes the announcer will call out the wrong name for the player I'm using. On the stats page, even with the highest stats, the numbers are sometimes highlighted in red. Please fix the game. This game is really fun but the rosters need some serious updates. So many players in the game are retired and it looks like EA doesn't care at all. Plus with the new update the music glitches and stops playing when I go on fire. The commentary voice is now seriously glitchy, and the turbo button is not working. Before this update, the commentary voice was bad for announcing some of the players names and team names. Obviously Steph Curry being an 8 in threes is ridiculous yes, but on top of that there are players in the game whose ratings are even worse. Kawhi Leonard, a player who If I am correct shot 50% from three point this year, has a TWO rating in 3pt shooting. Paul Millsap is honestly terrible if you know how to steal at all. You can tell they got lazy because there are many characters who are talented in real life who have the exact same horrible rating. Like EA is not even customizing ratings in this game between players. It's a shame because this game is really fun and EA is clearly not putting in the effort to satisfy its customers. Game logic is almost non-existent. Game is RIGGED. I was "On Fire" and missed 7 in a row and on 8th attempt I faked out defender and knocked him down. He recovered and jumped across several feet to block my shot before I could release the ball. If I make an attempt to steal, I can't get off the ground to block a shot. Too many inconsistencies and stupid bugs. You're under the basket and jump to block and your player automatically jumps away from the ball. Play on rookie level and the other team plays like expert. CPU players can steal from you several players away from in front of you or behind. Game does not have integrity... a POS! No stars. Correction negative five stars. Seen your updates and the game went from poor to a waste of space. Calmly put, the game under performs. Turbo seems useless. Controlled & CPU players on my team randomly move away from the ball. My CPU player rarely attempts a block and fails the vast majority of times when he does. Almost impossible to block short range jumpers around the hoop when my player jumps away from the ball. So it’s cool and all, I can beat teams on the hardest difficulty, beat the campaign, all that, it’s cool, whatever. My problem is the challenges, scoring triple the opponents points.. it seems like first two quarters, you can hit almost anything, easily juke or just run around the guy guarding you, I usually go up to like a 45-6 lead at halftime.. but apparently, all teams have the warriors 3rd quarter drive, and block anything I throw up (even when I knock them down right before shooting), always connects on their shoves, and will get every steal they go for, whereas I magically can’t steal anymore, and can’t block, because after halftime, all they do is dunk the ball... so 45-6 lead at half turns into a 55-20 lead at end of 3rd, which makes triple score harder.. then of course, magically, 4th quarter, same thing.. steals blocks shoves for them, nothing for me, ends up being like 65-35.. not even double.. This is possibly the greatest game of all time. There are a few adjustments to be made though. Rosters should be changed to where each team has 4-6 current players every year and 1-2 legends. For example add klay kd and dray to the warriors and Kyrie and Hayward to the Celtics. It would be cool if you could make like a myseason mode where you play 41 games and then the playoffs or a way to play multiplayer with people around the world. Also you could add trump and pence to the republicans. If you could add Kareem, Jordan and older players. The best way to keep this game alive is to spice it up. Take players a give them a dynasty to build. This will be a very good game if y'all can keep it updated. This game is awesome, great nostalgic play for us 90s big kids, it has some glitchy controls I must admit. If you’re holding down turbo on offense and go for a shot it passes the ball almost every single time. For this being a premium game, and in the top 100 for as long as it has, it deserves roster updates at least a few. It appears they made some at some point but there needs to be more. Either that or allow customized trades, it’s your highest ranked sports game, do some updates. And pay Jordan, good god the GOAT needs to always be in these games, and he never is. Make it happen. 4 stars for a 5 star playability game for now. Great job remastering it for touch interface. How about giving this great title to a company that will actually show it the respect it deserves? This game should be the benchmark for the iPhone 5, but no none nada zip updates in forever. Sad. Laggy & embarrassingly outdated rosters make this a current version an "I'll pass". UPDATE … 5 YEARS LATER … Love the new update! Gameplay is impeccable. The wider X screen is better for gameplay because now my thumb doesn't cover as much of the court as it did on my 7+. Graphics are amazing. The screen could fit a little better on the iPhone X though. My review would be 5 stars if the rosters would've been updated. The older rosters do give it a bit more of a retro vibe, I guess. First off, FIX THE MASCOTS! They shouldn't look so skinny, and if they looked real I would EASILY rate this game 5 stars. So many people can't play with mascots in NBA 2K and if they looked real here EVERYONE WOULD GET THIS GAME!! Fixing that will bump the game up to four star caliber. The gameplay is a great concept, but the glitches are annoying. They are not unplayable glitches, but it really impacts the game. Sometimes, when I swipe from the sprint button to the green button, it passes, or pushes, and when I swipe to the from the sprint to the blue button, it jumps instead. This goes on for a few plays and it's really annoying. The rosters really need updating too. This is getting ridiculous. Y'all seriously need to update your rosters and ratings. I got really excited the other day when I saw there was an update for this game, and even more excited when it took forever to download because that meant it was a big update, but of course, the rosters and ratings did not change. I'm from Orlando, I love playing with the Magic, but I can't because Oladipo has TWO'S for everything. TWO'S. How did y'all botch that so bad? And then of course there's Kawhi with a 2 three point rating, Steph with an 8 three, Love with a 6 three, etc etc. How hard is it to fix these? If y'all aren't going to, at least give us the option to so we can do what you're too lazy to. The game is great, to the controls, gameplay, and overall I have no complaints. But the rosters and the stats of players are what gets on my nerves. As a Nets fan playing the game, I hate seeing Deron Williams and Joe Johnson there when they left the team and the only player left is Brook Lopez. And if I'm not playing for the Nets, it is also a problem with the uniforms. And, a suggestion, to add all-star teams and update that team every year in all star weekend, while updating the roster at the beginning of every season. I've been playing this game for awhile but still haven't seen the rosters updated to the most current players and given the correct ratings. I was excited to see that there was an update and was hoping to see Durant on the Warriors to finally replace David Lee, BUT STILL NO ROSTER UPDATES. Some teams have players that aren't even in the league anymore, or are completely irrelevant. Also, the player ratings are awful. There are multiple big name players with sub par rating and vice versa. I think I speak for most people when I say the roster and player ratings are long overdue for an update, and make this game less appealing. The whiners of this game annoy me. The rosters here are from 2014. Everyone understand that. Stephen Curry although still on GS was not the same player in 2013 that he is now. I'll use EAsports NBA game on consoles as an example. Every year they release a game at $70 a pop. Why would this $2.99 App be updated with rosters every year for free? Use your heads people! Additionally, game play is great for a phone. Also great graphics. Please for the love of god update the rosters they’re a century old and that’s the only reason you get three stars and add some different players you can tell the last roster update was forever ago because Lbj and Kyrie have higher 3 point ratings then Stephen curry please just update the rosters who wants to buy a five dollar game and then get old rosters I don’t even think ea sports cares any more about this game!So please give your nba and ea games fans some love and listen to the people!!! I've been playing since 2011 lol, please update to what the current rosters are. Imagine being the Knicks and playing as KP and having the option of Rose and Noah, or The Clippers with CP, Blake and Deandre or even Golden State and playing as Curry, Durant, Green, and Thompson. Teams are stacked! Let's get an updated roster as soon as possible! EA, I would like to thank you for all you have already done! This can actually be one of the best games on IOS...the multiplayer game mode is awesome for example. The problem is that it’s clear the EA stopped caring about it. They charge a lot of money to really enjoy the features (I think $12 for the app plus upgrades) yet the rosters are all out of date and the player’s ability rankings are clearly done by people who don’t watch basketball. If you would please just respect the hard earns money people are putting in to buy this and update the app you would have a phenomenal product. This game never gets old. Yes, rosters are not updated, but to me that is not necessary to have fun playing this game. 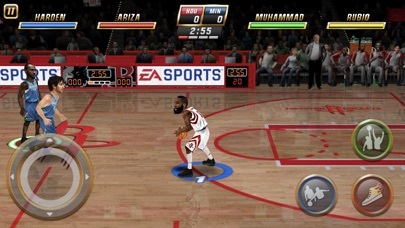 NBA Jam will always be a staple on my mobile device. Remember, for the few negative reviews you see about anything, the are numerous positive ones that never get read/heard etc. Thank you again. Since I’ve dl’ed this game it’s all I play. Can’t get enough of it. Just like the old arcade/genesis game I remember. Only minor downside is I wish they updated the current rosters more but hey it’s not like the original got updated so any roster update I’ll take. Well worth the extra $7 to unlock all the old school players. I'm a 90s kid and love being able to play this throwback on my phone. Something I would like to see is an even more difficult level and FOR THE LOVE OF GOD update player rosters and or at least update player skill #s. After buying this app years ago there is nothing left to play for when the makers simply won't update this. Can We Get A Roster Update??!! Great but could add some things. 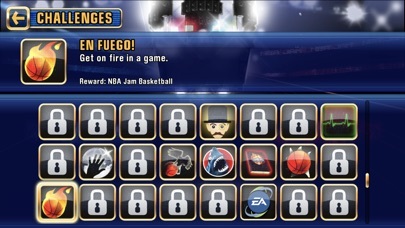 Could you( ea) add season mode?could you also add a halftime show please?could you make it so we can make substitutions whenever we want besides halftime please?could you add the old teams logos like the bobcats and the blue and light brownish wizards,etc?could you make an intro to the game?could you maybe have could like a shooting foul? Ok. For the longest time I too was frustrated that it did not work. In order to get the game to work you must DELETE the game and ALL its data first. 2nd reinstall the game and will work. The only reason why I'm giving it 4 and not 5 stars is b/c you will lose all of your previous achievements when you delete and reinstall the game. But Hey, it works now! This game is really great I love that I can play with old-school players against new school player but I really wish that the rosters were updated because then the game would be far more challenging and as of right now I'm beating everyone by at least 50 in legend mode. When it plays its amazing. But on iPhone C the game crashes about 2 and a half minutes into an exhibition match. Sometimes a little shorter sometimes a little longer. I hope you guys can maybe fix it because the game itself is quite good. Happily change it to 5 stars if it gets ironed out. Please try to fix the bug that crashes your game and doesn't save it. Every time I play a game it will crash periodically and sometimes will be like I never played the game at all, which means it doesn't save where I left off. Please fix in next update. And it would also be nice if you updated the rosters. I've had this app for years and I've never had an issue with it until the most recent update. It has become very difficult to get my player to shoot the ball. I would estimate 3 out of every 5 times I try to shoot the ball, the player passes it. This happened right after the update. And as many others have stated, if you claim you update the rosters & the stats, please actually do it. The biggest reason I give this game 2 stars isn't the fact that the rosters still haven't updated, it's the glitchy shoot button. I re-installed the game and went through the tutorial again and almost couldn't get through the shooting portion. Every time I would hit the shoot button I would pass. This game has the potential to have 5 stars, but until these are fixed...a measly 2.